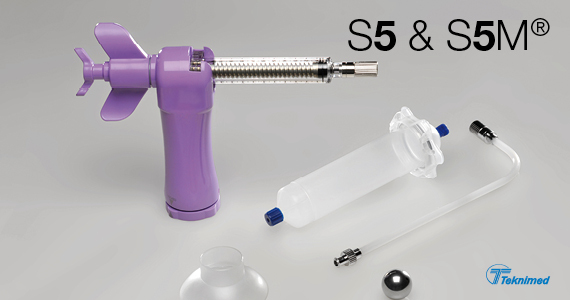 S5® and S5® M kits are designed for mixing and injecting acrylic bone cements. Vertebroplasty, Kyphoplasty, cementoplasty with low and medium viscosity bone cements. S5® is the first cement injector equipped with an automatic pressure-overload safety feature. The safety system is designed so that the maximum pressure permitted by the injector is controlled. It prevents from rapid and massive cement injection and device failures. S5® can be associated with Teknimed vertebroplasty needles.